which reminds you that Kate Spade might be having a sale so you go to their website and find an amazing deal on a bag…. you remember that the whole reason you sat down was to pay a bill, not buy a Kate Spade bag. Oh yeah, me neither. That never happens to me. Just kidding. This happens to me all the time. Well, I don’t buy Kate Spade bags all the time, but you know what I mean. I get distracted a lot – by my kids, my spouse, my ever mounting to-do list. It seems at any one given time, I’m being pulled in a hundred different directions, and I know I’m not alone. Psychology Today published an article that says your productivity can drop as much as 40% when you’re switching between tasks. I don’t know about you but I need all the productivity I can get. So often, we give ourselves a gold star for multitasking. However, I’m realizing that being a great multitasker doesn’t translate to having great focus. In fact, it means just the opposite. When we multitask we might feel like we’re getting more done because we’re making dinner and answering emails and listening to a podcast all at the same time, but the truth is we don’t do anything well or hear anything well or write anything well or even think correctly because there is just too much going on. I won’t pretend to have all the answers when it comes to getting focused, but I will say that I am trying very hard this year to fix some of my bad habits when it comes to distractions, especially online distractions. Everywhere I look online people are picking a “word of the year” and so right now I’m announcing that mine is FOCUS. 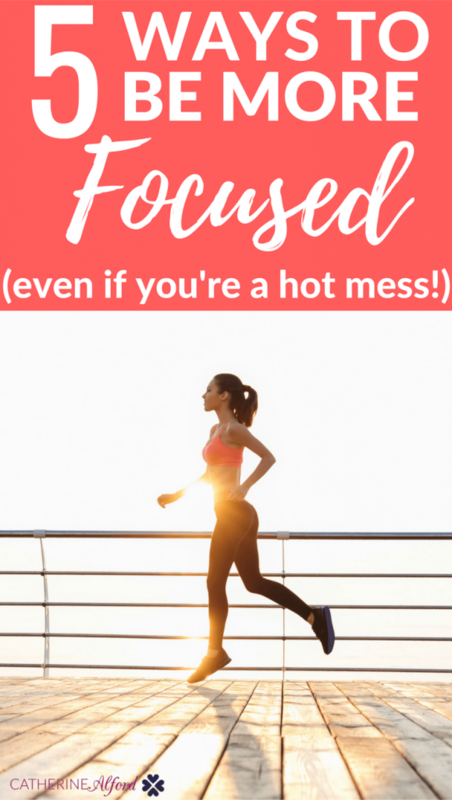 If you feel like you’re a hot mess too, here are five ways I’m getting focused in the five main areas of my life. Hopefully, this can help you too! When I am spending time with my husband and my kids, I might be there but my brain is doing this: Did I switch that load of laundry this morning? Did I defrost the chicken for dinner? Did I answer the e-mail from that brand asking for my availability for a phone call? Did I move that money from one account to the other? Did I pay that doctor’s bill? Once again, I’m not very focused, and it made for a lot of stress especially on the weekends. If the hubs happened to have a weekend off, I always took that to mean I got a break. He also took it to mean that he got a break. However, someone has to wake up early and feed those little creatures we created called children. It was leading to a lot of resentment with both of us feeling like we put in 110% all week and thus, we should be allowed to rest. Unfortunately, 2 year old toddler twins do not know the meaning of rest. What we decided is to plan more activities as a family. If we sit in the house, we’re overwhelmed with the to do list. Our bedroom door has been off of one hinge for weeks. A squirrel or cat got into the trash outside and spewed trash all over the driveway. There are dishes to wash, clothes to fold, and floors to mop. It’s just too much for two people who have careers and kids and zero family living close. So, we decided to get out more. After all, the mounds of laundry will always be there, folks. Last weekend, we took the kids to an indoor play area. They loved it. Then, the next day we took them to the children’s museum in Ann Arbor. They also loved that. The hubs is working both days this upcoming weekend, but I still am going to try to plan something fun for the kids. After all, what’s life for if you aren’t planning something enjoyable to do with your family? The thing is, I turn 30 this year, and I want a signed book deal this year. That’s not going to magically fall out of the sky. So, if I want my life to look like someone who got a book deal, I need to spend time working towards that goal. I have a bad habit of focusing too much on my writing clients and not enough on my own blog. 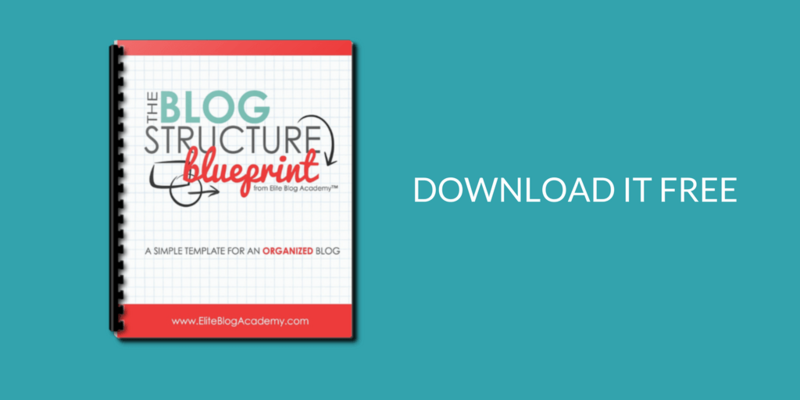 The blog stats won’t grow if I don’t spend time on it. So, my analytics on my book proposal can’t change or improve if I don’t put the work in. I’m committing to posting on this blog every Tuesday and Thursday. I haven’t had a set blogging schedule in years because I lost my way, but now I’m putting it out there to cyberspace – Tuesdays and Thursdays you can find new content here. You get the idea. Every single day we make choices that affect the rest of our lives. When it comes to your career, don’t waste the day. Each day is an opportunity to get you one step closer to your goals. Ah, finances. Well, this is a personal finance blog, isn’t it? I feel like it’s been a long time since I’ve shared how we’re doing in this area. In fact, a reader just e-mailed me and asked if I was going to write more about my husband’s medical school loans and how we’re handling them. So, yes, I’d like to do that. We had two main New Years Resolutions. The first one is to pay $4,500 a month towards our debts. The second is to stop ordering food in. (We waste so much money this way.) Now, $4,500 is a lot of money every month. Medical residents like hubby make about the same across the country at around $50,000 a year. I don’t mind sharing this because it’s just public data. This works out to around $3,000 a month from hubby’s income after taxes and health insurance come out. So, paying $4,500 every month towards debt means the entirety of hubby’s paycheck will go towards debt repayment plus some of mine. This is a very lofty goal and means I will have to make some serious business income. I wanted to set the number high, though, because that’s what goals are for. I don’t know if I’ll reach it each and every month, but I’m thinking I could get close if I work my tail off. I do have to be very careful though. Already in January, 3 of my 7 clients put their freelance writers on “hold” while they work out some things, have changes in leadership, and move over blog platforms which takes time. So, I already had a mild panic attack and started working like crazy to try to make up the difference in the loss in income. This is a good thing, though and it all filters back to being more FOCUSED this year. If you want to learn how I became a 6 figure freelance writer, I have a course detailing all of that information here. Really, if you want to focus more on your finances or become one of “those” people who is just plain awesome when it comes to money, I always tell people the very first step is just knowing where your money goes. I am madly in love with a free tool called Personal Capital. Basically, you sign up, link your accounts including any retirement or other investment accounts you have, and it will give you an overall picture of your financial health. There are a lot of financial apps out there. In fact I just heard of a new one called Change that will text you little nudges about your spending (also free, my favorite price.) So, I recommend Personal Capital so you can finally have all your data in one place and actually know what your net worth is, but then add in other financial apps like Change to help remind you day to day how to live your financial life better. I’ve been really upfront about how I’ve worked a lot on my mental health in the past year or two after enduring postpartum depression after my twins were born. I still have days where I’m overcome with anxiety and bouts of depression, but I can say my life and mental health currently is a major improvement from two years ago. I think it helps that my kids are almost 3 and they are starting to get pretty funny. They talk to each other a lot, and the hubs and I finally find ourselves laughing and enjoying them a lot more the older they get. Some moms love having infants and all that it entails. I think I love having older kids. I’m so independent myself that the more independent my kids get, the more I enjoy them. Life isn’t ever easy when you have little ones, but the little glimmers of hope and happiness are started to get more frequent. Towards the end of last year, I was in a really good routine with going to the gym, yoga especially, 2-3x per week. I had to take over a month off after having sinus surgery, but I’m hoping to get back in there soon. Every time I’m ready to head to yoga class, one of the twins has a cold, which means I can’t drop them off in the daycare at the gym. However, I’m very much looking forward to having this be a part of my daily routine. I’m also saving my allowance for a FitBit to help me track my sleep, which is a crucial component to health. (The Hubs and I each get $100 per month to spend on whatever we want no questions asked, so since the FitBit is over $100, I’ll need to save for about two months to get it.) I’m actually planning on getting the one in the photo below, and I’m not going to lie… it’s because it’s so purty. Lastly, the final category I want to focus on this year are my passions. Luckily, a lot of my passions spill into the other areas of my life. For example, one of my big life passions is writing, which I do every day at my job. Another big passion is yoga, which I plan to focus on more as well. I’m passionate about my husband and kids, so a focus on family is helping with that. When I write it out like that, I feel lucky that I do get to spend a lot of time on my passions but I think there is room for more. The hubs has inspired me a lot when it comes to music. He started taking violin lessons as an adult, and I have to say, he’s getting good! The kids love hearing him play. He inspired me to take piano lessons again, something I did all through childhood. I bought an amazing piano off of Craigslist and I’ve started going to lessons too. We even played a duet together at a Christmas recital. It definitely pushed me out of my comfort zone! I’m also reading a lot more. It’s something I’ve enjoyed doing my whole life, and it’s truly the only way to learn. I’m also taking the twins to the library every week to pick out new books. So far, they are just thrilled that the library has a train they can play with, but I know something will sink in. I recently learned about the 1000 books before kindergarten program, which is when you commit to reading your children 1,000 books before they start kindergarten. I bought each twin a log (shown below) so we can write down the titles of the books they read. Ultimately, I’m very optimistic about 2017. Like I said, I’ll be turning 30 and somehow I feel like this will be a big milestone for me. I really enjoyed the first half of my 20’s traveling a lot and living out of the country in the Caribbean. The second half of my 20’s I was pregnant and taking care of two little babies. I feel like in many ways I’m getting my life back or at least creating an even better life than I had before. I know I’m going to have hard days and days of disappointment. I know my marriage won’t be perfect. I know my kids will misbehave. I know I’ll have great months of income in my business and bad ones. I’ll have days when I can do every move my yoga teacher requests of me and days where I can barely hold a plank because I’m so tired. However I do think because I have a plan to FOCUS on these five core areas of my life and keep them in check, I will always be able to bounce back and get back on track. Everything else is just noise. Everything else is just fluff. There will be more things to focus on one day, but for now these 5 core areas of my life are important to me. So, now I want to hear from you. What were your New Year’s Resolutions? Do you have one big focus this year like paying off your debt or are you like me and trying to gradually improve all the major aspects of your life? Do you have trouble focusing? Is it just me or did focusing get a lot harder after social media became popular? Share in the comments below. I’d love to keep each other accountable on this focusing journey! My word is FOCUS too. Basically what you described in the intro is me every moment of every day. It’s HARD! I love this! Focus is also my word for 2017. Sometimes looking at all my goals makes me overwhelmed, and then I shut down mentally. I think anxiety is hard to tackle because it makes me want to put out fires instead of focus on the bigger task at hand. Exactly. It’s hard to work when there are so many things to take care of! Focus is definitely a great “word of the year”. Multitasking really does dilute your performance in each task and it took me a while to realize that. I find that focusing on one task, even if it’s just for 15 minutes or so, produces much better results than just half-assing it for an hour. And you’re right the kids do get a lot more fun when they get older! Thanks Syed! I totally agree! yes it’s been really hard focusing, and I don’t even have a husband, kids, or worry about running my own business! I do know for me, meditation is helpful. I think one HUGE thing I could also do is cut some crap from my diet so I FEEL my best. That makes handling other tougher things easier. But what’s the first thing I want to reach for in a stressful situation? Yup, you guessed it. I have to break that cycle! Yes I love that you meditate – I really want to try this too! This is a fantastic post, Cat! Thank you for sharing. You are doing so much and are working very hard. I really hope the book deal comes through for you. I wish I knew about freelance writing, blogs, and making money while being home with my children when I was in my 20’s. Keep sharing because you are inspiring other Momma’s looking for their way to a successful business! I imagine it really is difficult when you and your husband work so hard and are both looking for a break when the weekend comes. We struggle with the same issue, too. Exercise does wonders for your body and mind and is a must for me. It is my “drug” of choice. My hubbie and I both know, I am a much better and happier wife and Mom when I squeeze in at least 30 minutes of exercise. Focus is a great word of the year. 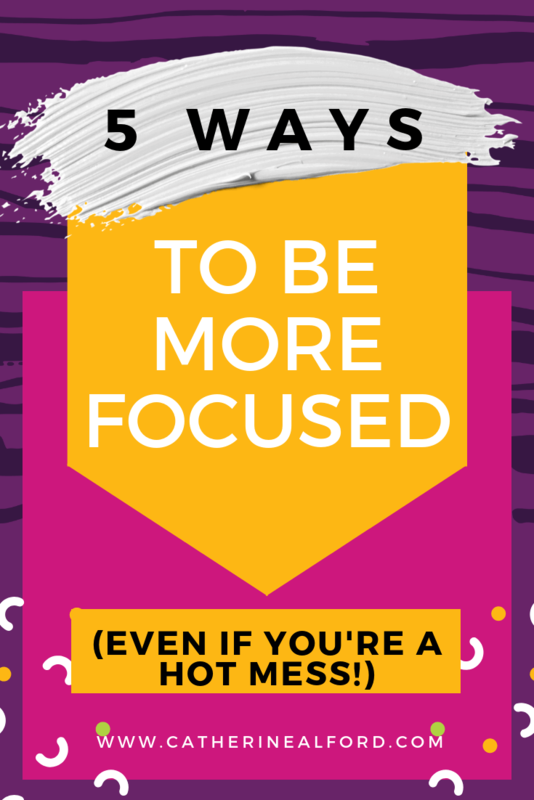 With so much to do all of the time, focus is a real struggle. When I am at work, I think of all the things at home I did not do or still need to do, bills I forgot to pay, and when I am home, I think about the gazillion projects I need to wrap up at work. I love that you love exercise so much!! I really do enjoy yoga and I want to do it more than twice a week! My word for the year is “enough”. I think I’m one step behind you: I feel like I need to focus first on gratitude and finding peace with where I’m at this year before I can move on to the big stuff! I found myself thinking “that’s exactly me!” so many times when reading this entire post from the neverending household tasks to the kids who are always sick when I want to go to the gym. I definitely need to focus more this year to be able to achieve my goals. I took a productivity course last month (through Ruth Soukup) and it seriously helped my focus so much. One thing I did was to adjust all the settings on my social media accounts and my iPhone so that I wouldn’t be constantly interrupted by outside messages. It was huge! Best of luck to you :). Aw thanks! I know we all have similar struggles with home! I bought the productivity course from Ruth too and I’m halfway through it!